To cure dry skin (also referred to as dry seborrhea or dog dandruff.) that consists of symptoms such as mild itch and skin flaking, and if your dog appears comfortable, home treatment is appropriate. Here the problem tends to be more cosmetic than the sign of an underlying health issue. Follow the three steps described below which includes the use of an oatmeal based shampoo for itch relief or coal tar based shampoo and conditioner to dissolve skin crusts, a switch to a high quality diet (if necessary), and the use of supplements associated with improving canine skin condition such as zinc, fish oil (Omega-3) and homeopathics. 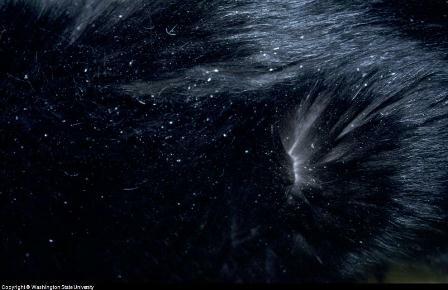 The itchiness and flakiness is also referred to as dry seborrhea or dog dandruff. If the condition worsens after trying home treatment, or is accompanied by other symptoms such as hair loss, skin papules or changes in your dog's behavior, then a trip to the veterinarian is required. Possible causes of more advanced cases of dry skin on dogs includes parasites such as mites (mange), fleas, infections such as ringworm or dog skin allergy. Dietary change to low-fat diets can also cause skin and coat flaking. Prescription medications are needed for cases where there is skin inflammation or dog skin infection. Future problems can be prevented by following the simple steps described below and by bathing your dog less frequently. If you want to cure dog dry skin our suggestion is that if the condition is not severe and your dog is not in significant discomfort, try some of these home remedy approaches to cure dog dry skin first. Home treatment for dry skin in dogs includes nutrition support, supplementation, bathing, and moisturizing products. The first thing an owner should do is to rule out underlying causes such as poor diet. Also make sure your dog is flea free by using a monthly flea preventative, as well as a product that prevents intestinal parasites. If your dog is losing fur, or scratching and chewing, then see a veterinarian who can rule out allergy as the cause and who can prescribe the necessary treatment approach. If you ruled out all of the above, then consider using a coal tar shampoo since this will dissolve and remove crusting dog skin. If the condition worsens then see a Veterinarian to determine if the skin condition is caused by some other problem such as mange (parasites) yeast infections, fungal infections, ringworm, and fleas. Even many of these such as mange, fleas and ringworm can be treated at home first. A quick call or visit to the Veterinarian never hurts if is an affordable option for you. What Causes Dog Seborrhea (dry skin with flaking)? Seborrhea can be a primary condition in rare cases, meaning it is caused by a dysfunction in your dog's skin cells. The process of skin cells dying and being replaced by new cells is referred to as keratinization, where there is a laying down of a keratin layer on the outer surface of the skin cells. A problem or defect in the keratinization process leads to an overabundance of keratin, which then causes dog skin itch and flakiness. The dead skin cells are called dander. 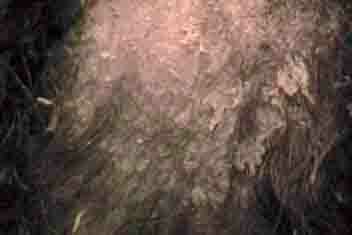 Keratinization disorders are also referred to as exfoliative dermatoses or seborrhea. Any condition that changes the fat or lipids of the skin, the content of the skin, or that dries the skin will change that size of packets that are shed, causing scaling or dandruff. When skin cells are shed normally, they are usually invisible to the human eye. 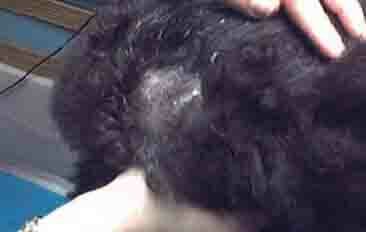 Symptoms include skin odor, or some problem with the skin or coat (scaly, crusty, waxy, greasy), and skin odor. Ichthyosis is diagnosed using a skin biopsy. There is no cure and it can lead to severe infections and other skin problem. Depending on the severity of the condition, it may be managed with frequent baths and anti-seborrheic shampoo, topical creams and synthetic retinoids. There are cases of primary dog seborrhea which is not Ichthyosis. These cases are also diagnosed with a skin biopsy. Cases are referred to as being dry (seborrhea sicca), greasy (seborrhea oleosa), or some combination of the two. These cases of primary seborrhea can also be manage with moisturizing conditions and medicated shampoos. Patients may require baths 2x to 3x per week until the skin condition is under control. Once controlled, the number of baths can be reduced. Supplements are not a cure, but may help to control the condition. A poor or new diet that is not providing enough of those food components needed for healthy skin. For example, table scraps and human foods to not provide the proper level of 40 food components required in a dog's diet. If a diet is too low in fat it can trigger skin problems. In some cases a dog that is put on a low-fat diet to control an internal disease or to control weight results in dull, dry, flaky coat and skin. The condition will improve when the diet is restored or if a supplement recommended by the veterinarian is used. Internal parasites such as roundworms, hookworms, coccidia, heartworms, mites. These parasites keep the necessary nutrients from getting to the skin cells. Dog skin allergy such as flea allergy, food allergy and atopy (seasonal or environmental dog allergies), can cause dog dry skin, skin itch and flakes. If your dog is not on a flea preventative, try this approach to see if it helps. If the itching continues to worsen, or if your dog is losing hair or red skin spots appear, see your veterinarian. In puppies in particular, if the pup is not on a heartworm medication, or intestinal parasite preventative, parasites could cause dry skin and flaking. To cure the dog dry skin problem, these causes will need to be eliminated. If the seborrhea or dry skin condition is mild, consider this three step home treatment recommendation to cure dog dry skin. First, check your dog's bathing routine and your choice of shampoo. Avoid shampoos that are not formulated specifically for dogs since they are not properly pH-balanced. Also avoid any dog shampoo formulated for fleas, or that contains alcohol as these can dry and irritate canine skin and do not work. You are better off using a flea preventative recommended by your veterinarian. The ideal shampoo for dogs is one that contains colloidal oatmeal such as Groomers Blend . The shampoos may also contain an antihistamine such as pramoxine (an antihistamine) or hydrocortisone (a steroid), which is a steroid that improves the effectiveness of the oatmeal. Colloidal oatmeal helps to reduce dog itchiness and skin inflammation, helping your dog to feel more comfortable. Oatmeal also helps with any canine seborrhea since it reduces flaking dog dandruff plagued skin. As an alternative, you can also use a dog shampoo that contains coal tar such as Synergy Labs Antiseborrheic Medicated Shampoo, or the human shampoo Neutrogena T-gel® once every week for 2-4 weeks,. Allow the shampoo to lather and work into the skin for 5 minutes. Be sure to avoid any contact with the dog's eyes, and rinse thoroughly. With coal tar shampoo, be sure to also apply a leave-on moisturizer, such as Virbac’s Resi-cort® to avoid further drying of the skin. Your dog should be bathed 1x or 2x per week. Be sure to lather the shampoo into your dog's coat and skin, leaving on the skin for several minutes before rinsing. The benefits of the dog shampoo can be extended if followed with the use of a moisturizing conditioner or a spot-on dog moisturizer such as Dermoscent. A moisturizing conditioner can be applied after shampooing or even between baths to extend the benefits of a moisturizing shampoo. For cases of acquired or secondary seborrhea, bathing can stop once the condition ends. Bathing will be needed as an on-going treatment method for genetic or primary seborrhea. Dog dry skin problems could be the result of poor nutrition. Make sure your dog food is AAFCO certified, the industry certification used for foods that meet the standard for balanced nutrition, which means that it contains the correct amounts of proteins, fats, carbohydrates, vitamins and minerals. Most major brands are certified. Bargain or generic brands that are not certified may not be nutritionally balanced and will not provide the nutrition support needed to cure dog dry skin. Home made diets, while well intentioned, should be prepared by a veterinary nutritionist who can suggest a combination of the required 40 food components and supplements found in the ideal canine diet. It is now well accepted in human and canine health that fish oil naturally contains fatty acids can be a helpful part of any program to cure dog dry skin. The best fish oil is found in natural salmon (e.g; Only Natural). When reviewing different fish oil brands look for the ingredients Eicosapaentanoic acid (EPA) and Dihydroxyacetone (DHA) which are omega fatty acids that can help to replace the moisture in your dogs skin.In dogs, zinc can help to improve the regulation of the immune system, which in turn affects dog allergies that may contribute to dog dry skin. Provide the fish oil or Omega-3 supplement daily per the manufacturers recommendation. Vitamin A and E supplements can also sometimes be used to improve dog skin health.Check with your veterinarian to determine if these would be effective and helpful for your dog. Zinc Methionine in products such as Zinpro is another supplement that is known to help skin cellular function, including the shedding of older skin cells while new dog skin cells are created. Last, a homeopathic product that strengthens the body's natural ability to maintain a healthy skin and coat can also be of value such as the popular product PetAlive Skin and Coat Tonic for Dogs. It contains horsetail, dandelion and Spirulina, all elements known for their positive impact on skin. Discuss these options with your veterinarian who can review your specific approach to cure dog dry skin as well as track any progress from the use of these or other supplements. 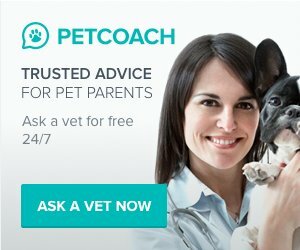 If your dog's skin symptoms consist of just mild flaking or itching, then the home treatment described above to cure dog dry skin is appropriate.If the condition is worsening over time, or if you see symptoms such as redness, hair loss (alopecia), or if there are oozing lesions, these are signals that it is time to visit a veterinarian who can prescribe medications that can reduce skin inflammation (steroids), treat dog skin infection (antibiotics), or to help with itch. The Vet will take a skin sample and take an ear swab to check for a bacterial skin infection or yeast infection. Stool and blood samples are used to check for heartworms or intestinal parasites. If the initial round of tests indicates a bigger problem, then an additional blood panel will be recommended to check for canine hypothyroidism, endocrine problems or other conditions which are affecting your dogs entire body (systemic problems). 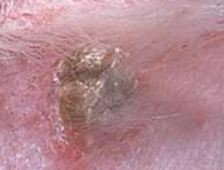 Dry Skin Seborrhea and the Resulting Papules. Cause of the Condition in the picture is idiopathic or unknown. To cure dry skin on your dog, ask your veterinarian about switching to a shampoo formulated for canine seborrhea, a condition that is also referred to as dog dandruff, since it resembles the human condition. Canine seborrhea symptoms include (in addition to flaky dry skin) itch, thinning hair in patches, scabs, bumps and pimples. The treatment for canine dandruff or seborrhea is bathing with a medicated shampoo every other day for 10 days. Decrease the frequency to twice a week then once a week as you see improvement. There are two types of medicated shampoos for dandruff. Be sure to get the type for dry skin which contains the ingredients sulfur or salicylic acid such as Vet Solution Universal Medicated Shampoo. Dog shampoos with benzoyl peroxide or selenium sulfide are primarily for greasy skin, not dry skin. Shampoos with coal tar can dissolve skin crusts (see step 3 above). Only bathe your dog in warm water. Consider using an after bath spray with the ingredients glycerin, colloidal oatmeal, fatty acids, or urea such as DermAllay Oatmeal Conditioner. The Vet can also suggest ways to prevent future cases and how to cure dog dry skin, which may include following the home treatment approach outlined above. In addition to following the three steps outlined above, avoid bathing your dog more than 2x per week. Opt for regular brushing instead. Brushing helps to stimulate the production of oils that help to prevent and cure dog dry skin. As long as your dog's coat appears clean and he does not have a bad odor, there is not rush to bathe your dog. Have A Question about Curing, Treating or Preventing a Dog Dry Skin Condition? Our editors will pick 1 question to answer each week. Please include your dog's age, breed, medical history and if possible, a picture of the condition. Do you have a picture to add? It will greatly help our Vet provide skin care advice. Click the button and find it on your computer. Then select it. Mueller, Dr. Habil Ralf S.